Islamist movement's deputy leader makes clear it won't accept any of the Quartet conditions, even under a 'unity gov't' with Abbas. Speaking late on Saturday, Mussa Abu Marzuq said Hamas, which recently signed a reconciliation deal with the Western-backed Palestinian leadership in Judea and Samaria, would never agree to recognize Israel. Under terms of the deal, Gaza's Hamas rulers and the Palestine Liberation Organisation of Mahmud Abbas are to work together to form a new unity government which will prepare for national elections. But Israel reacted furiously, saying it would not negotiate with any government backed by Hamas, whose charter calls for the destruction of the Jewish state, and accusing Abbas of effectively putting the final nail in the coffin of the latest round of US-brokered peace talks. But Abu Marzuq said Hamas would never accept the Quartet's conditions. 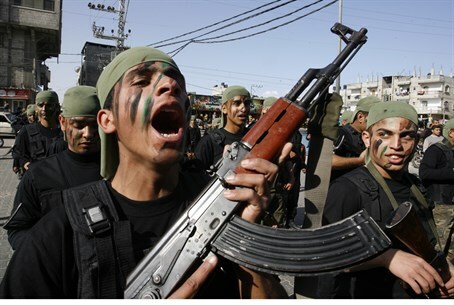 "Hamas rejects the Quartet's conditions because it denies some of our people's rights," he told reporters. "We will always refuse any conditions that deny our Palestinian rights." He also said the question of disarming Hamas's armed wing, the Ezzedine al-Qassam Brigades, was "never mentioned" in talks with the PLO since the unity deal was inked on April 23. Azzam al-Ahmad, a senior member of Abbas's Fatah movement, which dominates the PLO, was to arrive in Gaza City on Sunday or Monday to begin consultations on forming the new government, he said.